I just came across another interesting use of technology – to create biomineral agricultural and soil-enrichment products from bio-organic wastes! wow..yeah – if you read about N-Viro International, you too will be intrigued! N-Viro International Corporation utilizes patented technologies to stabilize and disinfect municipal bio solids and other organic waste products. These technologies safely and efficiently transform waste streams into beneficial reuse products. The N-Viro technologies involve the mixing of municipal bio solids with specific alkaline waste products from the coal combustion electric generation, cement and lime industries. This process stabilizes organic waste through pasteurization and complete disinfection. N-Viro produces Soil, BioDry, BioBlend and Fuel. N-Viro Fuel is a newly developed and patented biomass fuel that has physical and chemical characteristics similar to coal and is created from municipal biosolids and other organic wastes like manure, pulp and paper sludge. So shall we say this may be the future for alternate renewable energy forms? Converting waste to energy is not an easy task!! Head over to their N-Viro website to see the procecsses involved! Heads up to these guys! Hope you have a great weekend..
You’d be in jail for a while! Twins in The IT Department!! 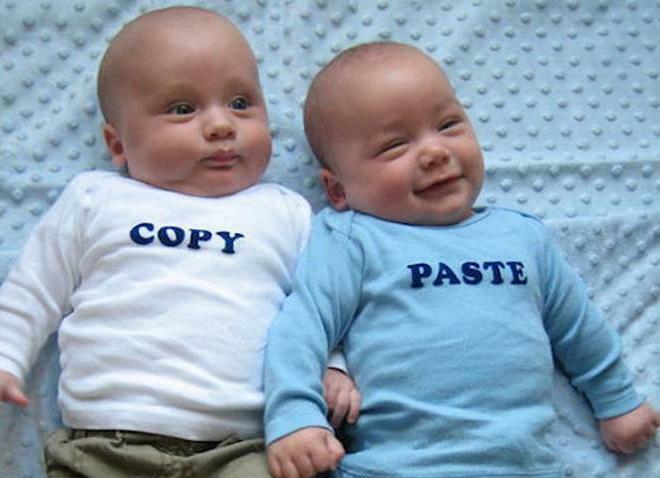 Someone in the IT dept gave birth to twins….Guess what they were named?? Lol!!! Have a good weekend!! Rentjungle.com’s smart new mapping technology civilizes apartment hunting. When it comes to apartment hunting, it’s a jungle out there. The best defense is rentjungle.com’s innovative spidering and mapping technology. Not only does it scour the web and aggregate pages to find every listing, but it presents those findings on an interactive map that makes apartment hunting so easy, a monkey could do it. You get more listings than any other online site, and an instant visual detailing the apartment’s location and what’s nearby: parks, shopping etc. RentJungle has the ability to search by number of bedrooms, price and distance with a simple pull down menu. The newly redesigned Rentjungle.com launched December, 2009 and within three weeks had experienced nearly 1000 unique daily visitors simply though word-of-mouth advertising. Behind its success is Rick Ferris, a real estate broker with over 30 years experience in residential and commercial realty. Tracking down your perfect habitat is difficult. Locating a place that appeals to you and the others who might be sharing your space is even more complicated. But Rentjungle.com’s new Apartment Search Facebook App, the first of its kind in the industry, lets you take advantage of Rentjungle.com’s revolutionary listing technology and share findings with multiple future roommates without leaving Facebook. No cutting and pasting links into an email. No texting friends and asking them to check out a listing. Your friends get to instantly see what you’re seeing, plus they can interact with your search and make their own recommendations—all on the Facebook site. The new Facebook Apartment Search App integrates seamlessly with other Facebook features. When you find a listing that makes you go wow, you simply click on the “Share on Facebook” button to share it with as many people as you like. You can add your comments, too. And, if necessary, you can insert the email addresses of friends who aren’t on Facebook—if you still happen to have any of those. The new comparison shopping feature gives you an inside look at whether you’re paying (or charging) too much for rent. How much should you be paying in rent? How much should you be charging in rent? These are the questions Rentjungle.com can now answer for you. Through its innovative comparison shopping tool, the site lets renters learn the average rent for their neighborhood—without feeling like their swinging from vines. It’s an important piece of info that comes in handy when renegotiating leases and trying to decide if it’s time to pack up belongings and hightail it to a new, more affordable habitat. Similarly, landlords can learn where they fall on the rental market food chain. If they’ve got too many vacancies, Rentjungle.com lets them know if they should be blaming their price point. It also gives them cold hard evidence for raising rents. Essentially, the rent comparison shopping tool saves people lots of time researching rates. With a simple click, they can now learn the average rent for apartments by size and amenities, as well as the range of rents they might expect in a neighborhood. If someone has been renting the same place for years, this tool can be really eye opening. “When you’ve been in a place 5-10 years, you don’t think about having your rent lowered. But in a down economy, you may be able to secure a lower rent just by having the facts,” says Ferris. The newly redesigned Rentjungle.com launched December, 2009, is the most comprehensive rental listing site on the web. It works much like other search engines in that it scours the Internet to amass apartment listings from a variety of sites. Unlike other search engines, though, Rentjungle.com specializes only in apartments. Users can search, sort and bookmark individual listings. Plus, users can also view listings on an innovative user-friendly map. Rentjungle.com was founded to fill a void in the online real estate market by offering a simple, easy-to-use directory and one-stop-shop destination for renters.